The IAC Awards MT Aerospace with the "Space Flight Awareness Award"
MT Aerospace AG has received the "Space Flight Awareness Award" for the firm's work on the NASA's SLS heavy-duty rocket system — the award was presented by former NASA astronaut and current Boeing Starliner space pilot Chris Ferguson on the recommendation of The Boeing Company at the International Astronautical Congress IAC in Bremen. Boeing is building the core and upper stages as well as the avionics for the SLS rocket system. NASA intends to use it to send the most powerful heavy-duty rocket yet for manned and unmanned missions to the moon, Mars and into the depths of space. MT Aerospace provides gore panels, which make up part of the massive propellant tanks. Gore panels are pie-shaped sections of aluminum alloy that Boeing welds together to create domes for the liquid hydrogen and liquid oxygen tanks. MT Aerospace also applied their in-depth expertise to discover a significant and unexpected natural aging effect on the hardware. Based on the aluminum and processing heritage at MT, with more than 50 years of space industry experience, a comprehensive evaluation of material data and test results was performed, and results were shared with Boeing and NASA. The Space Flight Awareness (SFA) program is a motivation and recognition program for NASA contractors who bear a major responsibility for the success of manned space missions. The SFA program is managed by the NASA Headquarters Human Exploration and Operations Mission Directorate. Carsten Landmann, the CFO of MT Aerospace, said it is a great honor for the company to be part of Boeing's world-class supply chain. That is why the firm is particularly pleased that this work is appreciated that MT Aerospace is recognized for delivering quality products. 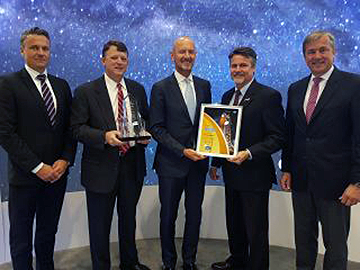 Dr. Gunther Schullerer, Director Head of Engineering MT Aerospace, added that the company's team is proud of this award because it also recognizes the firm's customer-focused efforts in a most important area of human spaceflight.